Best selling author of The Poison Tree Erin Kelly presents her latest novel Stone Mothers alongside crime-writing newbie and author of one of the most anticipated debut novels of 2019 Harriet Tyce (Blood Orange). They talk to award winning local author Sarah Hilary (Never Be Broken) about their exciting new novels and the enduring appetite for crime fiction the twistier, it seems, the better. Erin Kelly studied English and European literature at Warwick University and has worked as a freelance journalist for more than ten years. She has written for The Sunday Times, The Sunday Telegraph, The Daily Mail, Psychologies, Red, Elle, Marie Claire, Cosmopolitan, and Glamour. She is also the acclaimed author of The Poison Tree and The Dark Rose. She lives with her family in North London. 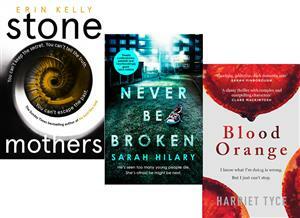 Sarah Hilary’s debut, Someone Else’s Skin, won Theakstons Crime Novel of the Year 2015 and was a World Book Night selection for 2016. The Observer’s Book of the Month (‘superbly disturbing’) and a Richard & Judy Book Club bestseller, it has been published worldwide. No Other Darkness, the second in the series was shortlisted for a Barry Award in the US. Her DI Marnie Rome series continued with Tastes Like Fear, Quieter Than Killing and Come And Find Me. Follow her on twitter @sarah_hilary.